I read The Trial of God by Elie Wiesel today. It is a premise with which I am very familiar, having read most of Wiesel's works, having seen the PBS special "God on Trial," being influenced by John Roth's "theodicy of protest," and generally thinking about and being concerned with my own personal integrity with how I view God. There are many quotable lines in the play, but one stood out above the rest. It is uttered by Berish. You would like to hear the victims? So would I. But they do not talk. They cannot come to the witness stand. They're dead. You hear me? The witnesses for the prosecution are the dead. All of them. I could call them, summon them a thousand times, and they would not appear hear before you. They are not accustomed to taking a walk outside, and surely no on Purim eve. You want to know where they are? At the cemetery. At the bottom of mass graves. I implore the court to consider their absence as the weightiest of proofs, as the heaviest of accusations. They are witnesses, Your Honor, invisible and silent witnesses, but still witnesses! Let their testimony enter your conscience and your memory! Let their premature, unjust deaths turn into an outcry so forceful that it will make the universe tremble with fear and remorse. There is an image that comes to mind when I read these words. 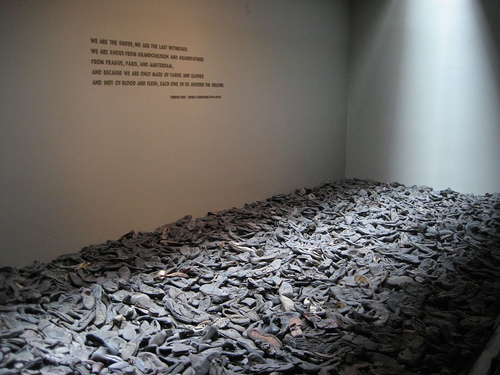 It is of the shoes exhibit in the US Holocaust Memorial Museum. Who are the invisible and silent witnesses in our world today? And how can we speak on their behalf?